The arms, armor, architecture, and customs of the Blades reflect their Akaviri heritage, most famously their distinctive Akaviri katanas and ceremonial armor. The order operated several strongholds, called temples, usually located in commanding positions among the mountains. Known examples include Cloud Ruler Temple in Cyrodiil and Sky Haven Temple in Skyrim. The history of the Blades stretches back many centuries, to the Akaviri Dragonguard. They relentlessly hunted dragons in Akavir, and in 1E 2703 they invaded Tamriel to continue this crusade. They marched through Morrowind and Skyrim with little resistance until being met by the united forces of Cyrodiil under Reman I at Pale Pass, in the Jerall Mountains. As soon as they heard Reman's voice at Pale Pass, they knelt before him and proclaimed him Dragonborn, claiming he was what they had come to seek. These new additions to his army did much to enable Reman's conquest and unification of most of Tamriel to found the Second Empire. However, the Dragonguard had not forgotten their original mission, and they continued hunting dragons, particularly in Skyrim, with great success. Dragons were driven nearly to extinction in the next two centuries, and the Dragonguard operated chapters across Tamriel under the direct command of the Dragonborn emperors. Unfortunately, as the Dragonguard had not yet evolved into the espionage specialists that were the Blades, they failed to prevent Emperor Reman III's assassination by the Morag Tong in 1E 2920. The Dragonguard was officially disbanded after this ignominious event, with many members becoming mercenaries and later forming the Fighters Guild. Unofficially, some were retained by the Akaviri Potentates, now as a covert force rather than an honor guard. Others continued hunting the wary surviving dragons in Skyrim until at least 2E 373. Later, during the long Interregnum, in the absence of any true emperor to protect, they protected his Ruby Throne in the Imperial City from the petty warlords rampant in Cyrodiil. Some would-be emperors formed their own personal 'Dragonguard', although these were only imitations of the Akaviri, not a continuation. It is speculated that the real Dragonguard may have sought out and protected potential Dragonborn, including the future Tiber Septim, in a bid to place one on the throne. With the Septim Dynasty sundered, the Blades once again secluded themselves in their temples to await the coming of another worthy Dragonborn. Eventually, Titus Mede was declared Emperor, beginning a new dynasty, but he was no Dragonborn and so the Blades did not truly serve him. Rather, they foresaw the threat posed to the Empire by the Thalmor of the Aldmeri Dominion, and worked covertly to combat them for years. Without support, however, these efforts could not last forever, and in 4E 171, an Aldmeri ambassador delivered to Titus Mede II the severed heads of every Blades agent in Summerset and Valenwood, sparking the Great War. 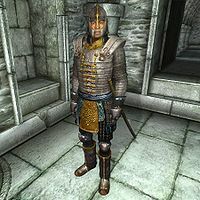 The Blades appeared in four Elder Scrolls games: Daggerfall (Represented by Lady Brisienna), Morrowind, Oblivion, and Skyrim. Esta página foi modificada pela última vez à(s) 01h04min de 11 de setembro de 2015.